Microgaming brings you another slot game inspired by the nature and animals. This is the first slot based on the habits of an eagle. Intrigued? Well, you should be. This is a pretty new theme in the world of online slots. 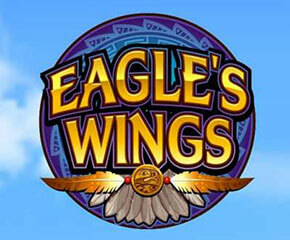 Play the Eagle’s Wing slot at Monster Casino for a totally different kind of experience in the gaming world. What does the Eagle’s Wing behold? The Eagle’s Wing slot has 5 reels and 25 paylines. The background features a snowy mountain in the middle and is pretty colourfully decorated. Start the game by setting the bet in the first place and then click on “Lines”. The number of paylines can be adjusted to a maximum of 25. Click on “Coins” to alter the size of the coins. The option of “Bet Max” will allow you to place your bet and help in spinning the reels. Click on “Expert” and “Autoplay” to let the reels spin on their own. Hitting “Spin” will set the reels into motion. The main focus is on the Bald Eagle and it also forms part of 2 symbols. A leaping fish and a little eagle are also included in the symbols. The lower value symbols are given by the playing card icons. Look out for the wild symbol which is given by the Eagle’s Wing logo along with a coin scatter symbol activating the bonus feature. Stacked Wilds- Look out for the stacked wild symbol in the base game. There are higher chances of winning as better paying combinations can be created. The wins which will include the wild will be multiplied by 2. Lucky Eagle Bonus- Trigger the main feature on landing 3 or more coin scatters. These can be placed anywhere on the reels to trigger the Lucky Eagle Bonus feature. The bonus will let you pick coins from the reels along with picking up a number by landing certain coins. A specific number of spins are assigned with each coin and the maximum you can collect is 60. Multiply the number of wins by 3x and then you can win big amounts. Re-trigger these free spins on landing more of these scatters. A basic slot game featuring the world of birds and animals. The graphics and the animation part of this slot are well-designed. 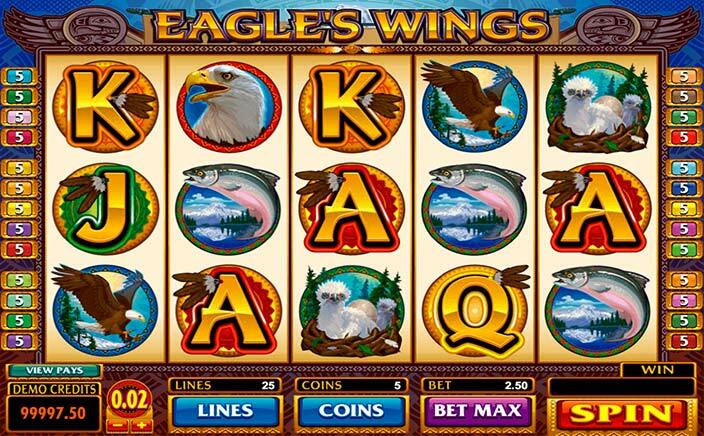 The winning combinations are well-paying making the Eagle’s Wing slot a must try for all the slot lovers out there.